Does "Simpler Super" amount to a death tax? Are the contribution caps fair? Are advisers obliged to collect TFN's? How to prepare as the regulators move from "educating" to "policing". Stuart has been a taxation officer since 1981. He has experience in a wide range of technical areas, including leadership of the Business and Personal Taxes Centre of Expertise and the Superannuation Centre of Expertise. Until recently, Stuart chaired the NTLG Superannuation Sub Committee. Tony's role includes acting as the Associations representative on a number of ATO senior tax forums. Before his CEO position, Tony was the Association's Senior Tax Consultant running seminars and contributing to many of the Associations publications. Before then, he had 12 years working for a number of multi-national companies holding varied senior management positions and 5 years working for a Chartered accounting firm - which included overseas assignments. Julian is a senior associate in the Maddocks Commercial team whose areas of practice include superannuation, trusts law and financial services. Julian, whose previous speaking engagements have included speaking to Institute of Chartered Accountants members on self managed superannuation and to the NSW CLE Centre on developments in trusts law, is a member of the ASFA Small Funds Discussion Group and is currently studying his Masters of Commercial Law at the University of Melbourne, focusing on superannuation, financial services and corporations law. Craig is the Partner of Financial Planning Services in Sydney at one of Australia's largest accounting firms, Nexia Court & Co.. With a Master of Taxation, and a Bachelor of Business among his qualifications, Craig has over 12 years experience as a financial planner. Andrew is a director of HLB Mann Judd Chartered Accountants (SE Qld) and the head of the Financial Planning/Superannuation division, with extensive experience in all aspects of financial planning. He has a Bachelor of Business, a Graduate Diploma in Applied Finance and Investment, and a Diploma of Financial Planning. He is a Fellow of the Financial Services Institute of Australasia and a Certified Financial Planner with the Financial Planning Association of Australia. Nathan is a Principal of WHK Prescott - part of the publicly listed national network, the "WHK Group". He is also a member of the FPA. Nathan specialises in providing quality strategic superannuation and investment advice as well as portfolio wealth management to a wide variety of working and retired clients. 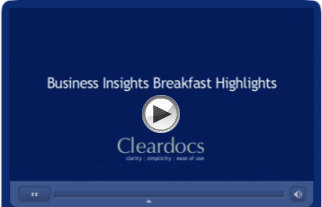 Edited highlights of the Cleardocs 'Business Insights' Breakfast Forum are available to view online here.